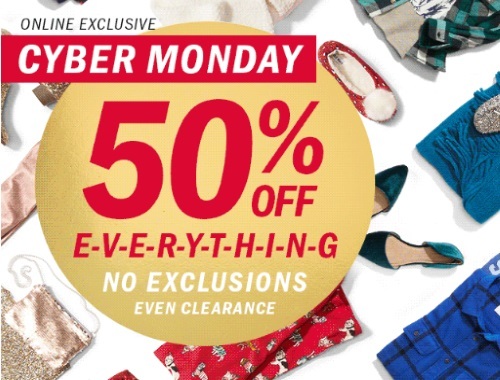 Old Navy's Cyber Monday deal is 50% off everything with no exclusions, this even applies on clearance items! 1000s of new arrivals and markdowns are now live! Plus get a Free Cyber Gift with any order! Limited time offer, while supplies last. Enter the promo code SOCKS to get a Free pair of cozy socks with your order! This is an online exclusive offer, available today only, Monday, November 27, 2017.